Right now is when everything in the garden turns the corner into full production. We’ve just past the longest day of the year and now it’s all about beating that long, downhill slide toward the dark and cold. November will come, but meanwhile we can make hay while the sun shines and harvest broccoli too. 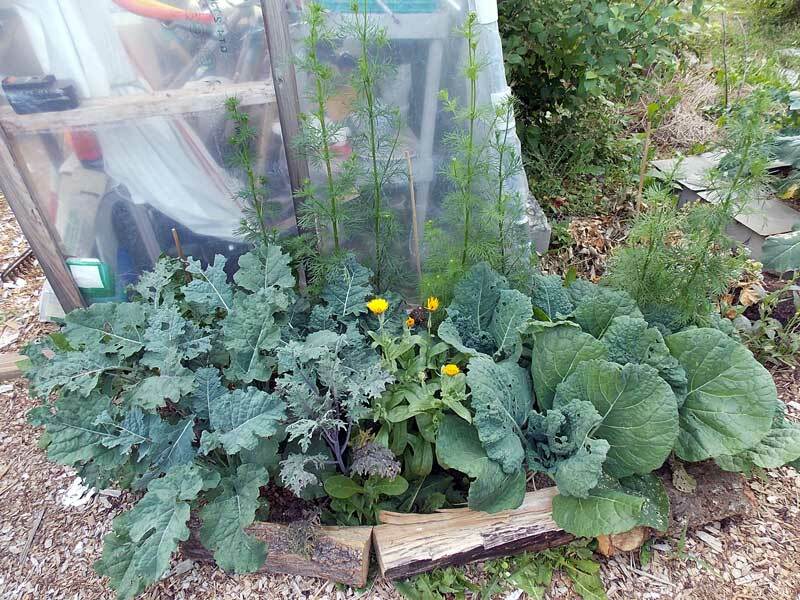 Broccoli, kale, cabbage and other brassica grow well under a variety of conditions, but in my garden they also attract pests if too many are crowded together in one place. 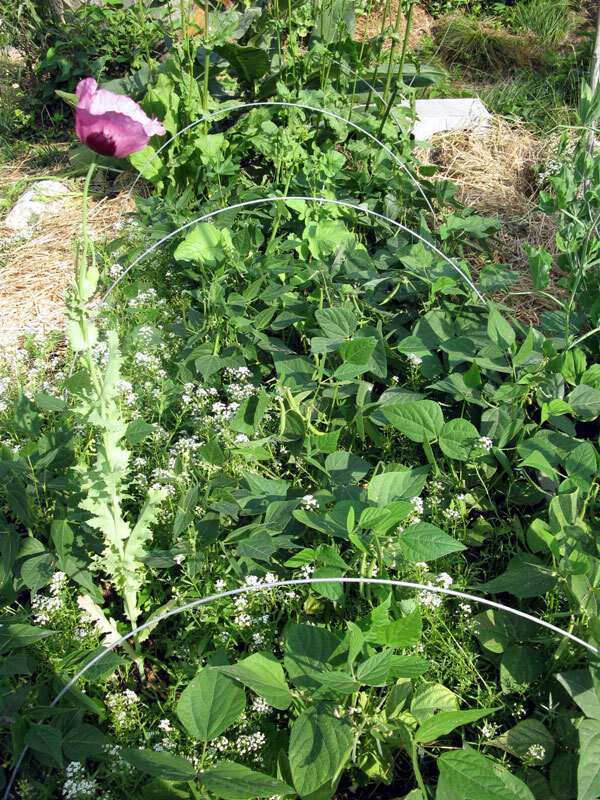 I spot plants around in odd areas to avoid cutworms, whitefly, and fleabeetles that find their host plants by scent. 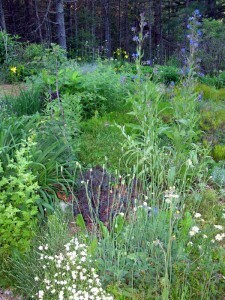 In the back is a row of larkspur flowering in its first year from seed – can’t wait to see the variety of colors. Tonight’s dinner is kung pao tofu with assorted greens. 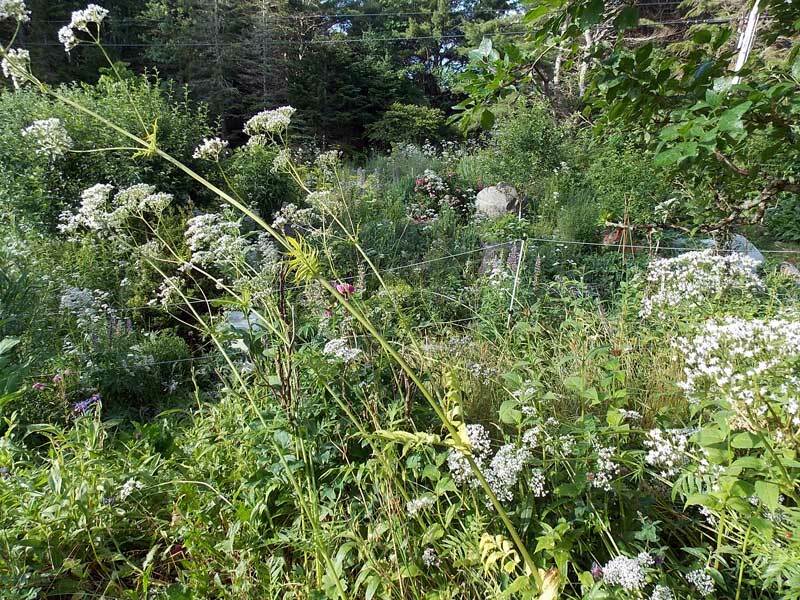 Some of the lower garden is buried in an onslaught of valerian. 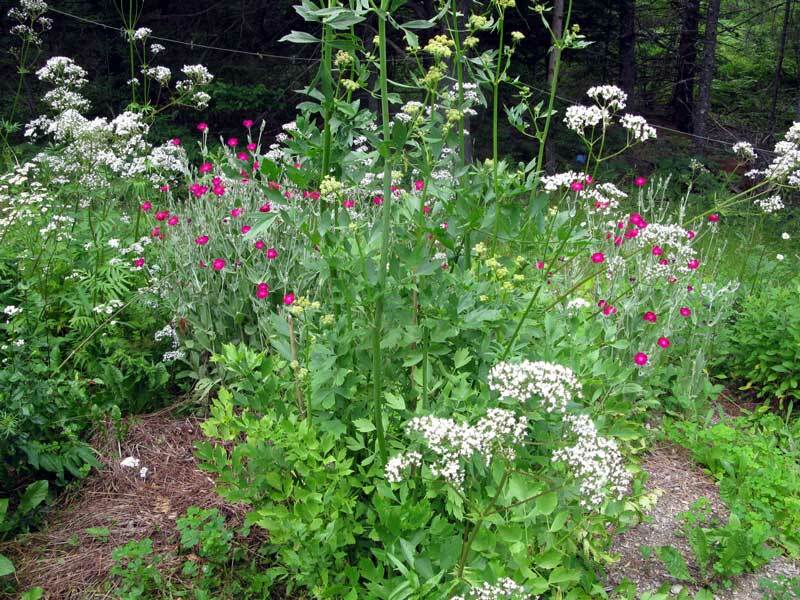 I don’t discourage it because it goes by quickly, the bees love it, and the roots make an excellent sleep potion (which as a bonus, smells like wet dog). 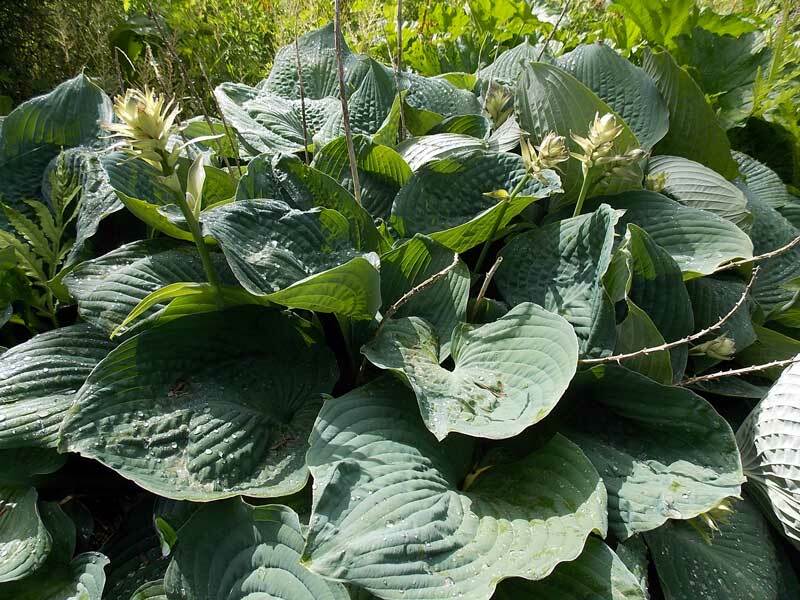 This is the season for big edibles, but the ornamentals aren’t far behind: Blue Angel Hosta maturing at 5′ by 6′ down in the swamp! For most of the year this seedum is a flat green carpet, but in July it becomes an alien solar farm. 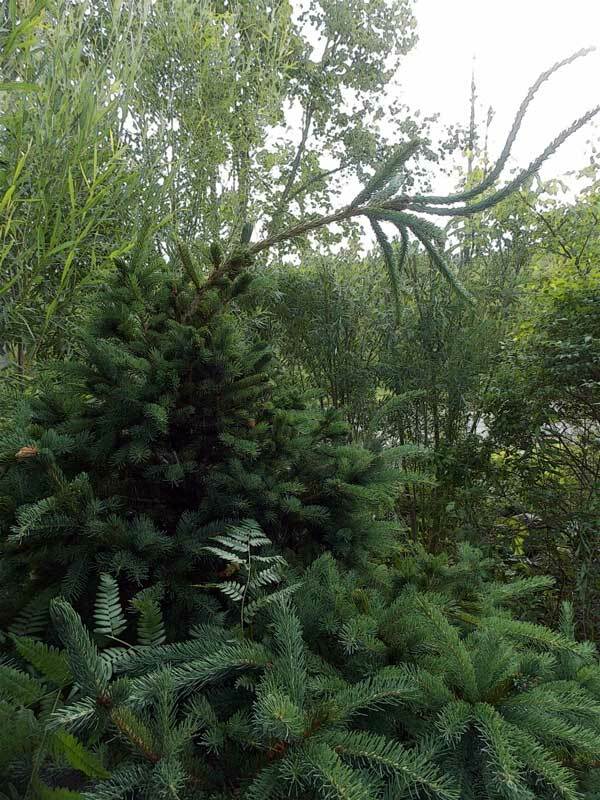 I have a finger-trimmed spruce going down in the swamp, next to the hosta. It’s ten years old and has been hand pruned at the tips each year. The “antler” is what happens when the gardener is called away without finishing the task! It’s not a fast growing tree, but it managed to put out this extension in four days – that’s a lot of pent up energy. 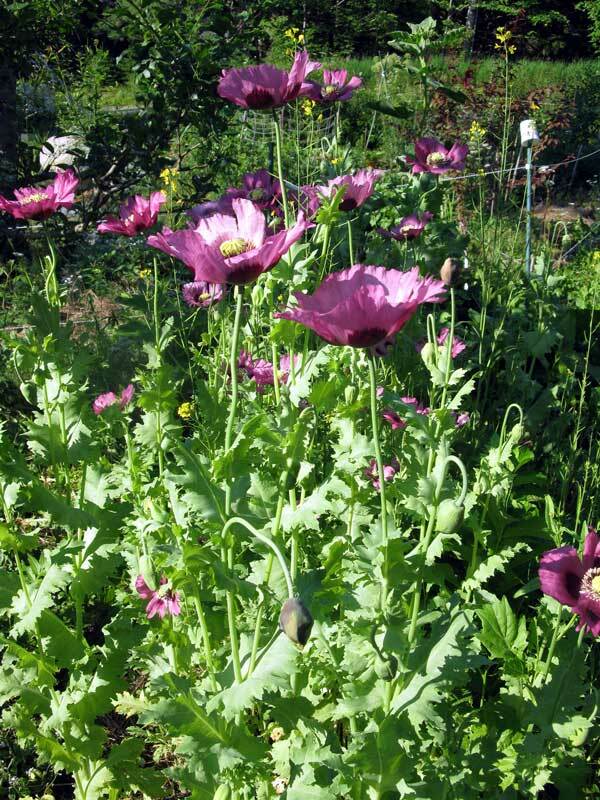 This entry was posted in gardening, the backyard, vegetable garden and tagged garden, harvest, summer on July 10, 2014 by APo. 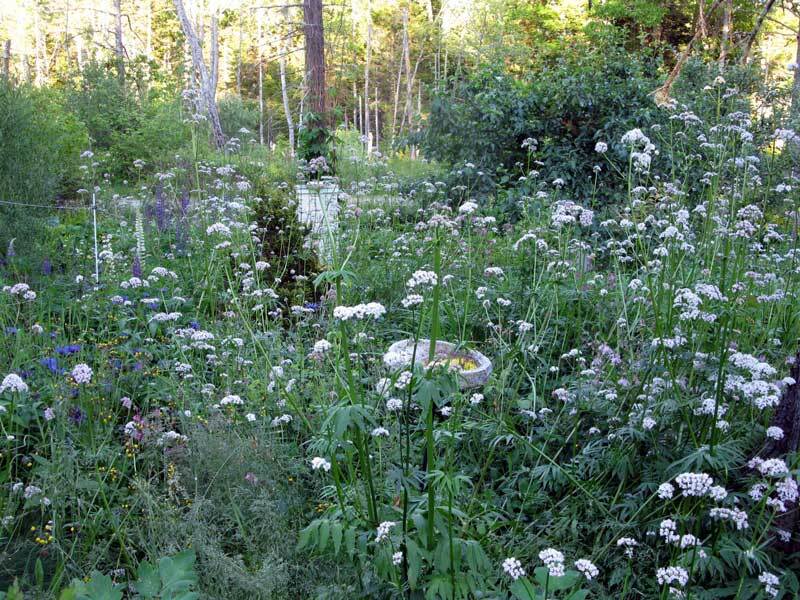 I love flowers, I paint flowers, and although we can’t eat flowers, I should step all over that Yankee nature and give serious consideration to creating a huge cutting garden. And maybe give in to the occasional impulse buy that turns out to be really cool – like Dutch Butter popcorn! This order and what I’ve saved from previous years will probably still grow more that we can eat, but perhaps I won’t feel quite as compelled to spend the entire harvest season canning tomatoes. Perhaps. 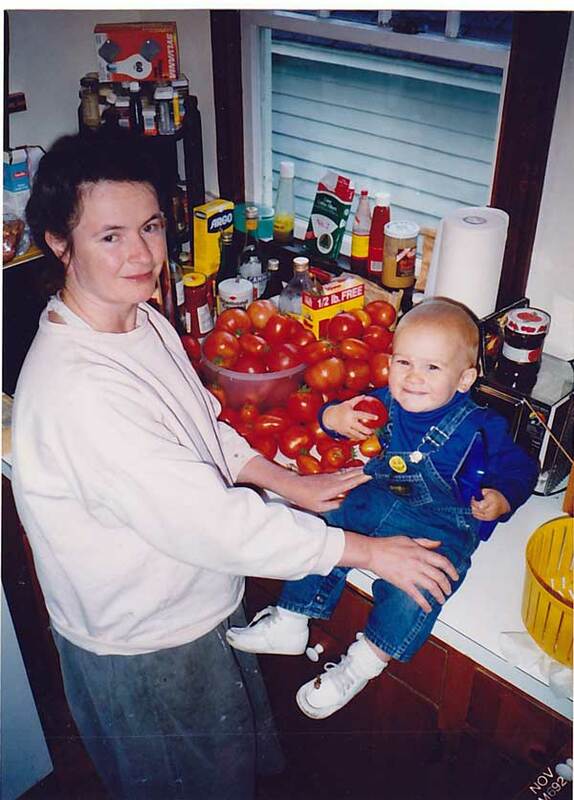 The baby in this photo is now 22 – obviously I have a long history of growing too much produce! 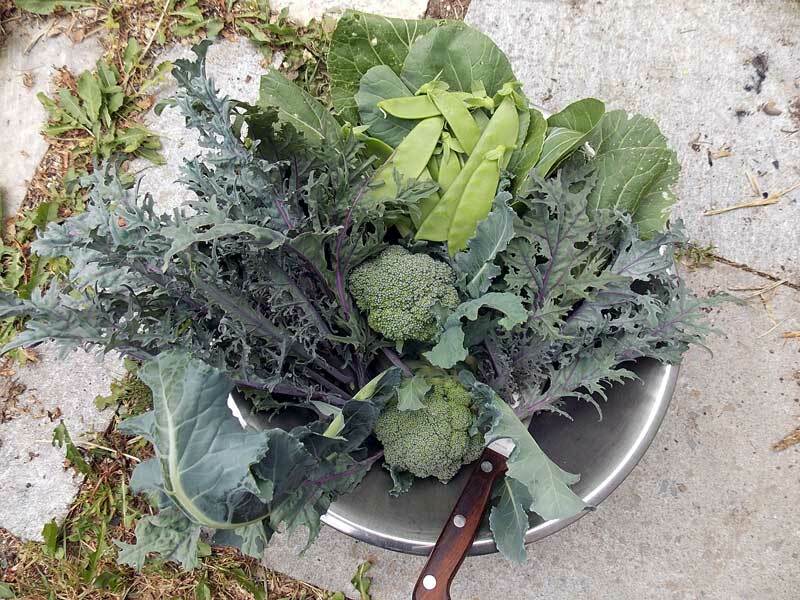 This entry was posted in gardening, Maine, the backyard, vegetable garden and tagged garden, harvest, seeds, winter on February 16, 2014 by APo. . . .it was summer in the garden. Not today, because we’re having a raw, wet March day with snow still on the ground, but summer will be back around soon. I was going through my photo files to find a particular study of quince and wild apples and found a few images that reminded me of what the weather will bring in the coming months once March with its snowy mornings is out of the way. 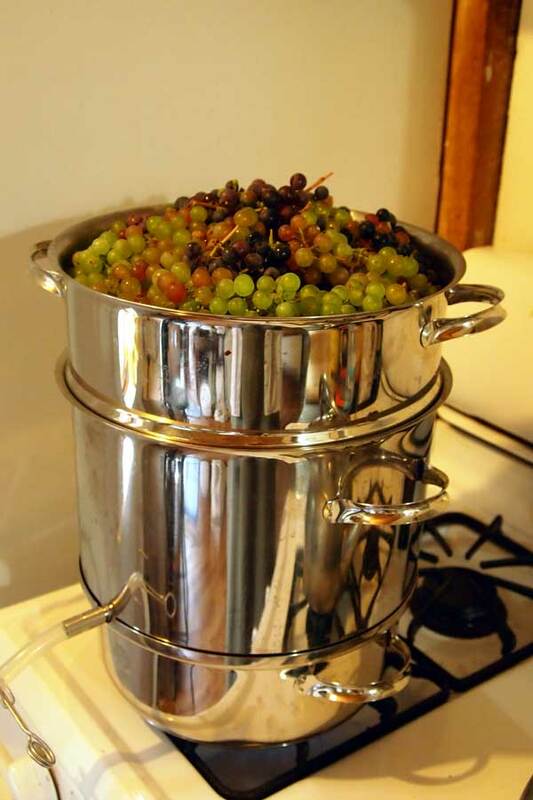 Below, a steam canner full of Beta and Somerset grapes ready to put the lid on, turn up the burner, and make juice. The vines look thin and sad in the garden right now because the posts are crooked and some of the wires are down, but I’ll be able to set things right in April. I made almost 5 gallons of grape juice concentrate last year and it was wonderful – rich and sweet. 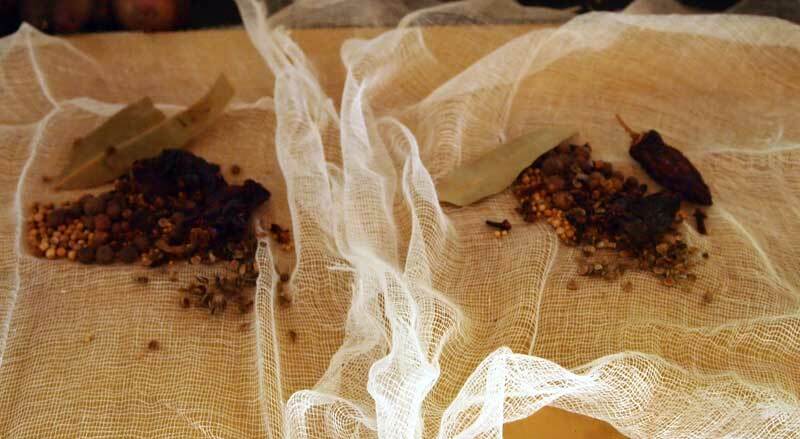 More on the way for 2014 as the vines mature! 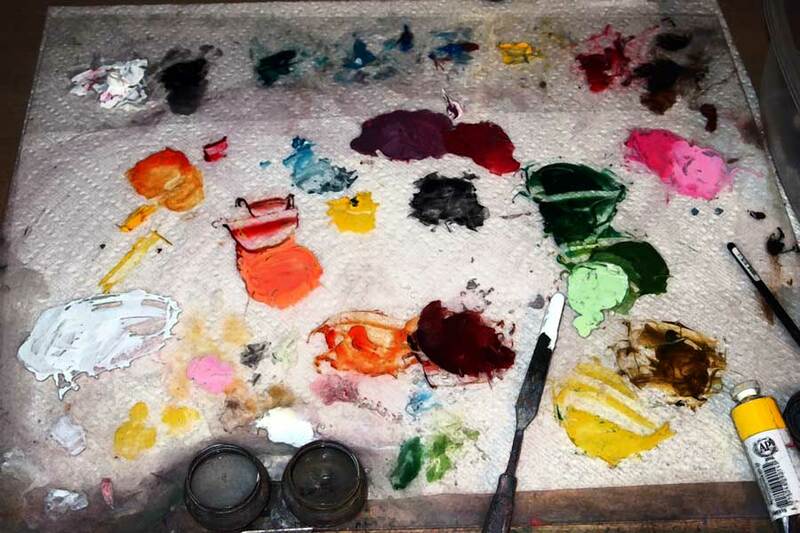 My pallet after painting peaches and geranium blossoms in the hoop house under the summer evening sun – light enough to work until 9 pm. 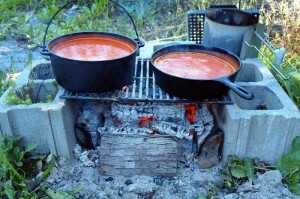 Setting up to make tomato sauce on the Hoosier cabinet. We put up 5 gallons (in pint jars) in 2012, none in 2011 due to virus, we’ll have to see what 2014 will bring. This entry was posted in gardening, horticulture, Maine, orchard, vegetable garden and tagged garden, harvest, summer on March 27, 2013 by APo. I finished my 2013 seed order today. I’ve been working on it since Thanksgiving, but with three separate plots projected for this summer I had some special concerns to work out. More on that later – here’s the full list with prices (OMG I spent over $100 on seeds this year!) and the occasional reference paragraph from the Fedco catalog. 2149 – Touchstone Gold Beet OG ( B=1/2oz) 1 x $6.20 = $6.20 Open-pollinated. The most refined and reliable golden beet. Much more dependable germination and uniformly round roots than others we’ve tried. Resists zoning. Like other golden beets, retains its color when cooked with the sweet flavor prized by aficionadoes. Performed well even when overcrowded in my trial. Takes the guesswork out of growing golden beets, “The first gold beet that’s ever done well for us,” reports Janine Welsby. 4218 – Bobcat Tomato ( A=0.1g) 1 x $2.50 = $2.50 (65 days) F-1 hybrid. Det. This cat is a perfect replacement for Seminis/Monsanto’s Big Beef. 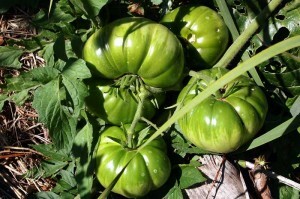 Has the same impeccable looks, disease resistance, slightly flattened round shape, 6–10 oz. 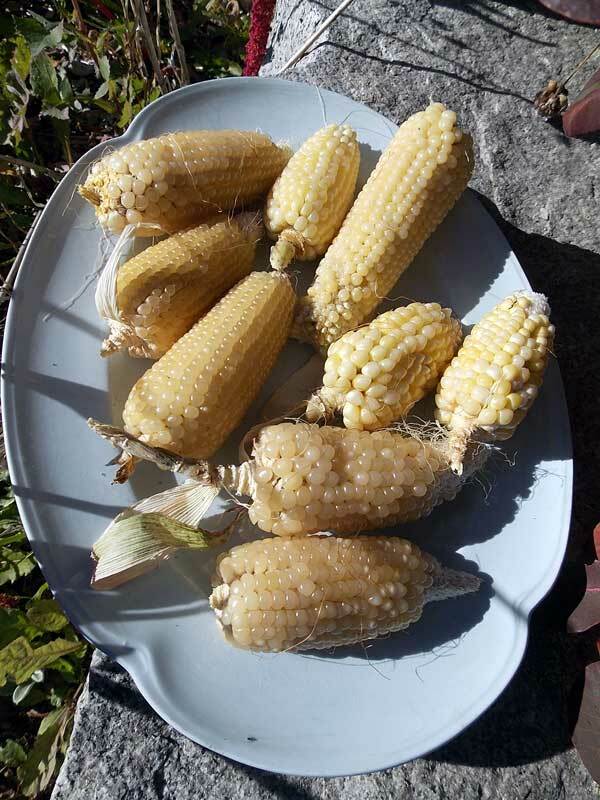 maincrop size, thin skins, midseason maturity and excellent taste. Flavor mild with a spicy sweet accent and slightly acidic complexity, color medium red. 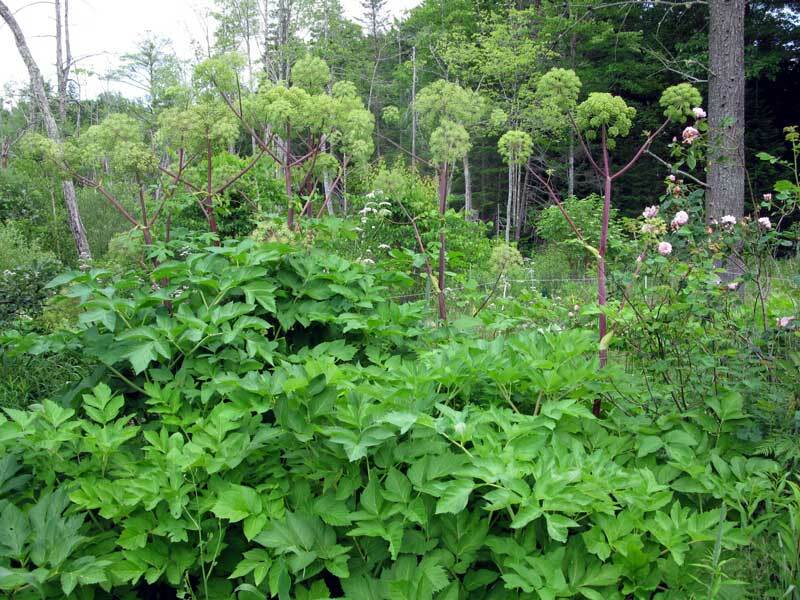 A massive plant with huge leaves, thick strong stems and big fruit set. From an Apr. 4 start and Jun. 11 transplanting, our trialer harvested her first ripe fruit on Aug. 15. 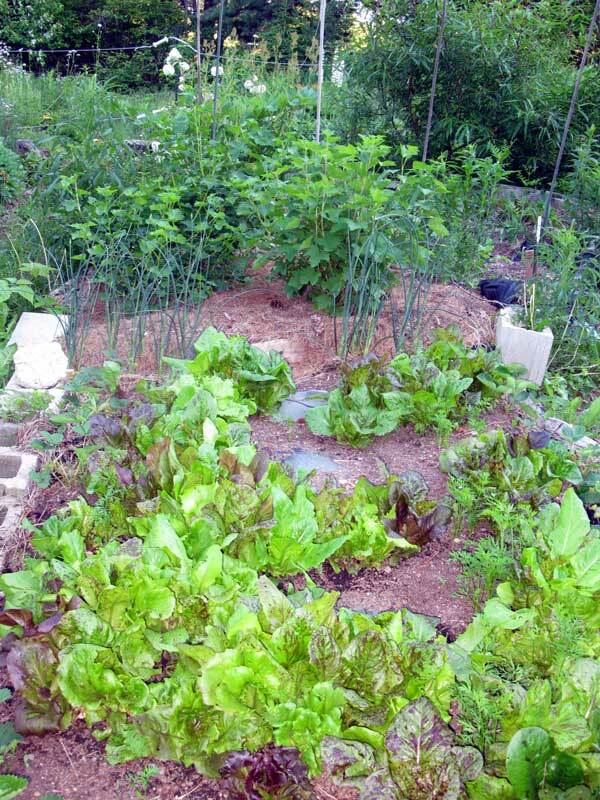 Resists F1, F2, GLS and N.
This entry was posted in gardening, horticulture, vegetable garden and tagged garden, seeds on January 21, 2013 by APo. Autumn is here. I can tell because I’m spending more time stacking firewood than picking tomatoes. It’s time to cull the seed order for 2013 by picking winners to repeat, and losers (not many of those, really) to drop. Descriptions are from the Fedco Seed catalog, online 2012 version. 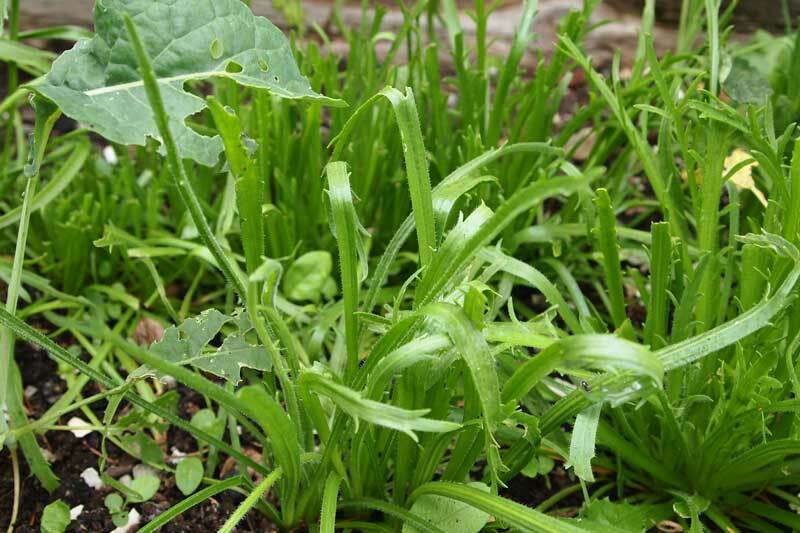 I love this green – it provides texture, flavor and a lovely bright green accent to salads and stir fry and grew beautifully all summer through drought and torrential rain. I found it energetic enough to “cut and come again” with no problem. 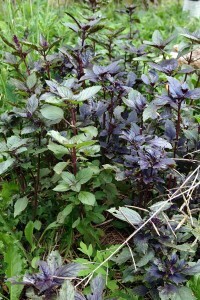 Aromato Basil OG Dramatic bicolor ornamental. 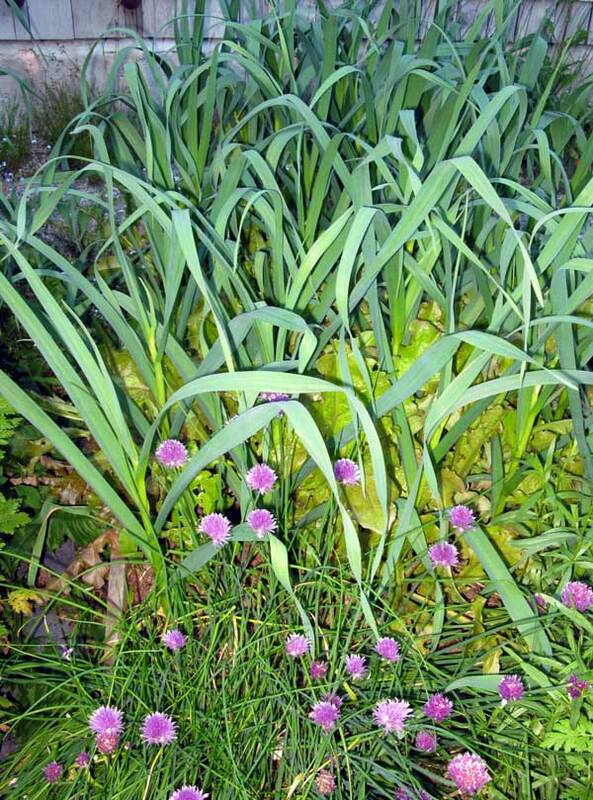 Broad bushes of mottled purple and green grow to 2-1/2′, providing a focal point. Starts purple and takes on a greener coloration. Pleasing anisey flavor and scent intensify when it is dried. 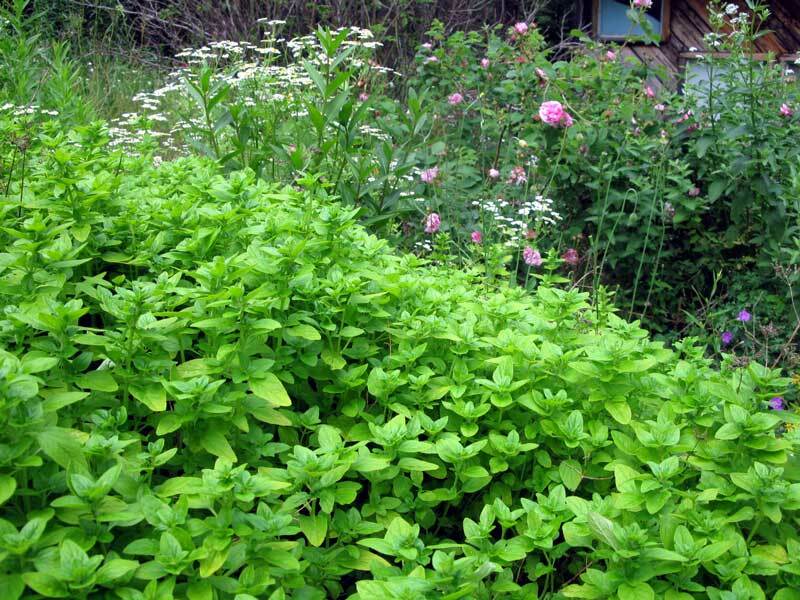 Makes a great herbal vinegar. AGRIOR-certified. I don’t normally dry basil, preferring to freeze small containers of pesto to retrieve as a fabulous quick dinner on dark February days, but Aromato has convinced me to dry at least part of the harvest. 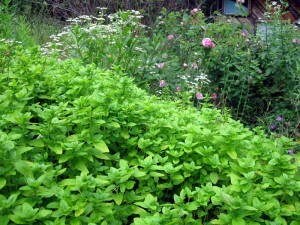 This basil has such a spicy floral scent that I’m tempted to use it in the closets as a sachet. Oh, and it also makes wonderful dark and mysterious pesto. Dakota Black Popcorn OG (100 days) Open-pollinated. Outstanding in our observation plots two years in a row. 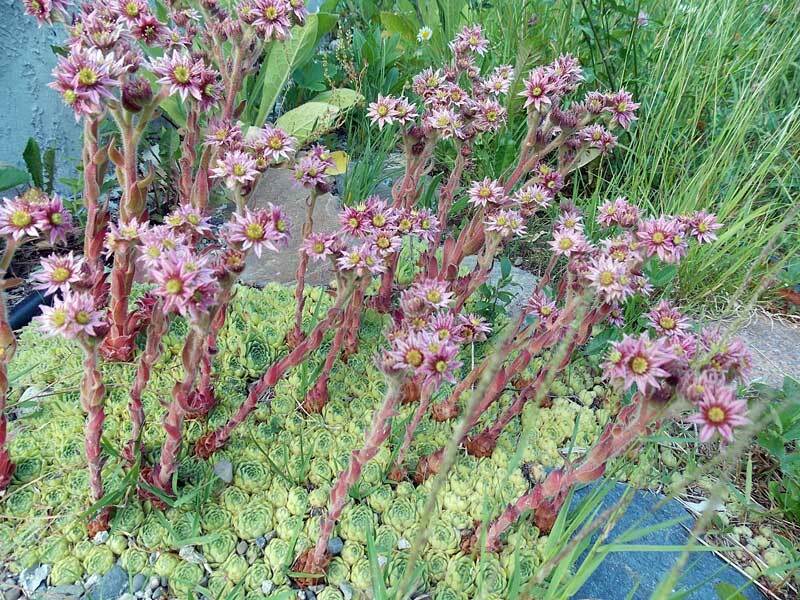 Compact plants with one ear each. 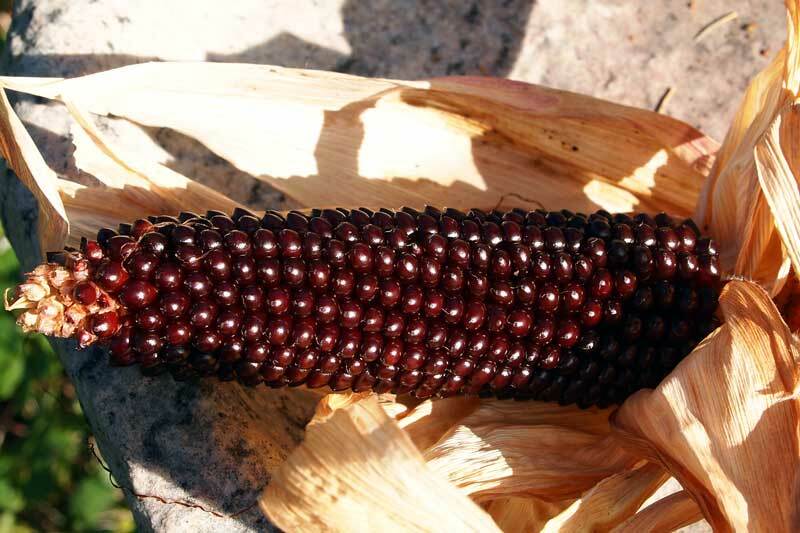 Our tasters rated the popcorn “Oh, so scrumptious.” In addition to their popping qualities, Dakota Black’s 4-1/2″ dark maroon-black ears with 15 rows are extremely decorative, a must for the fall roadside stand. 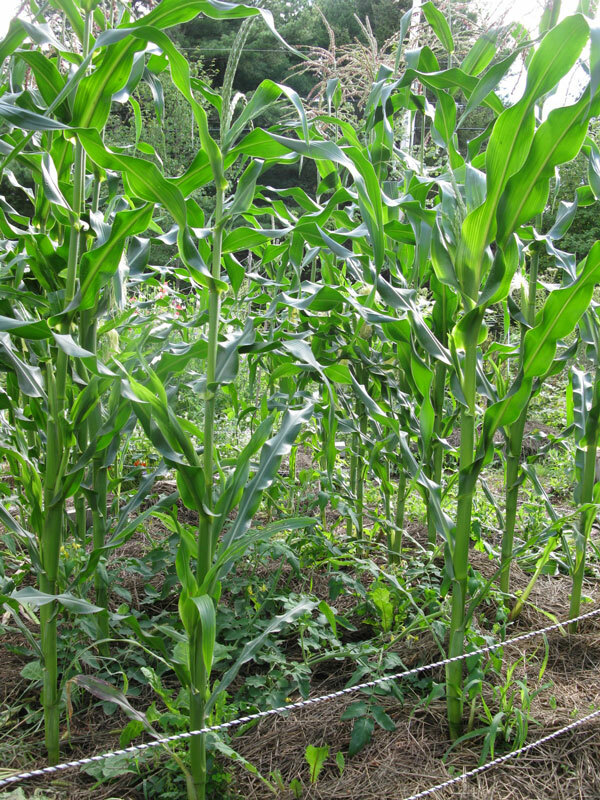 4′ stalks. ICS-certified. The ears are still drying on the stalks so I can’t tell you how it tastes. It’s so beautiful that I don’t even care if we never pop any. Blue Gold or Peter Wilcox This goldie was our best seller at the Portland Farmer’s market, and an easy one to wholesale, too. The twin sister to Red Gold, and practically an early-season potato. 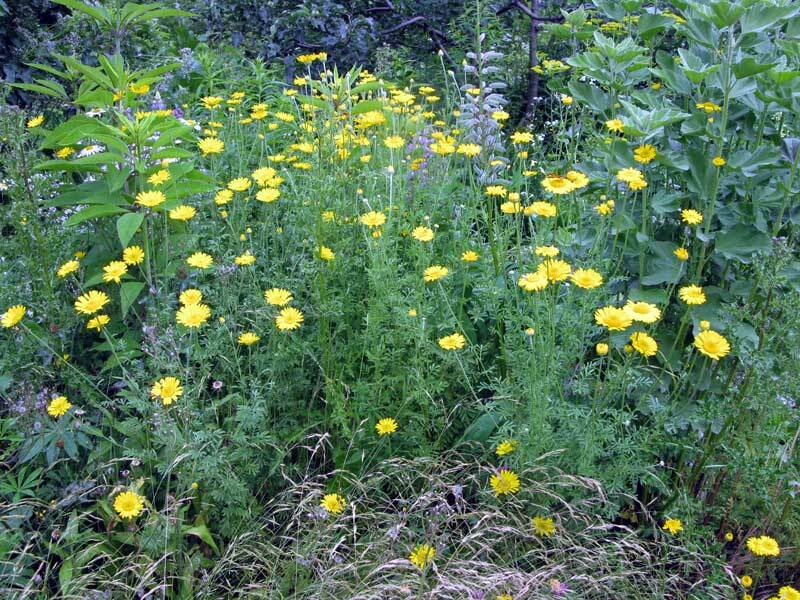 Trialing it last year, we had great germination, a high yield, and delicious hash browns. 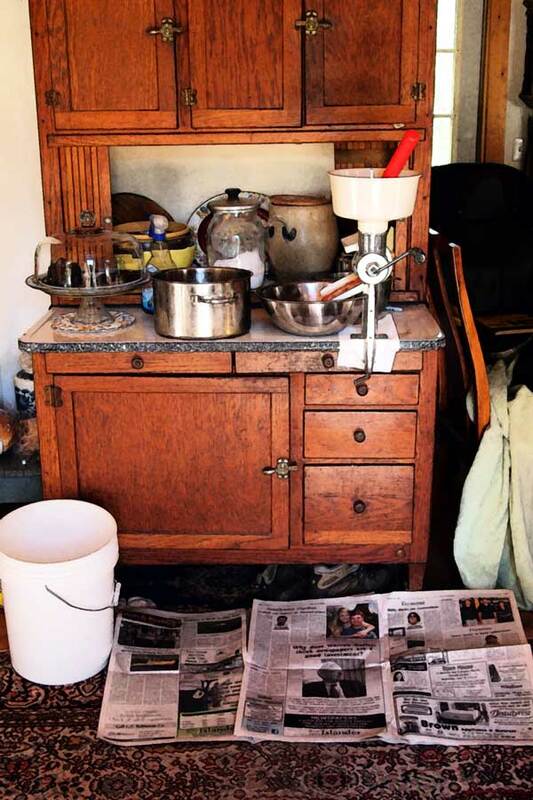 You could dig it later too, as it stores durably. Sets tubers in a wide hill. 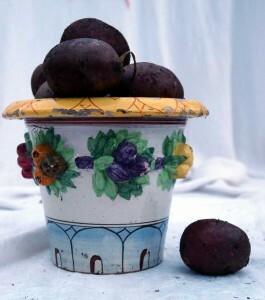 Wonderful taste, great texture, easy to dig and perfect skins – my new favorite potato. 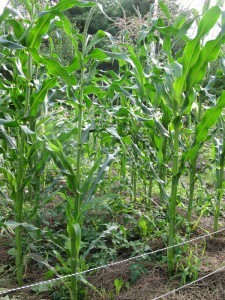 Harsh drought and high heat with no watering does not seem to have impacted the yield. 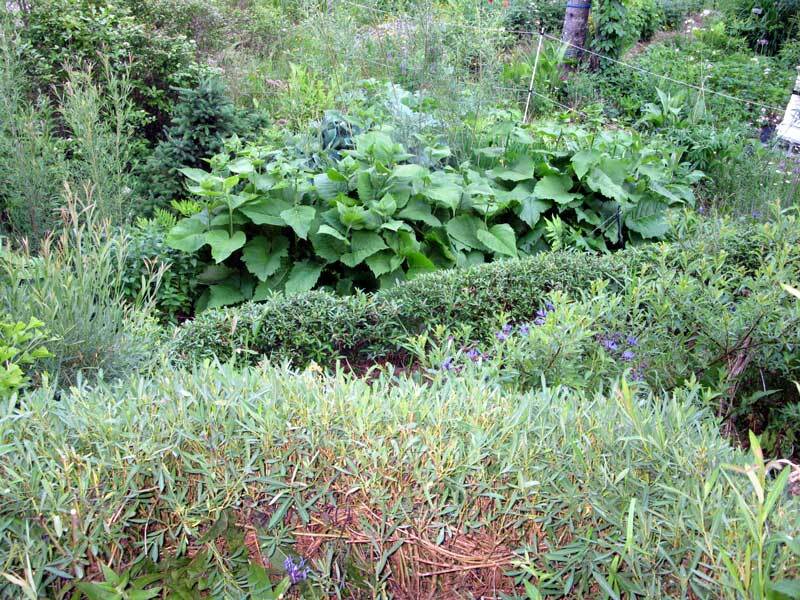 This entry was posted in gardening, horticulture, vegetable garden and tagged autumn, garden, harvest on September 14, 2012 by APo. I have a post nearly finished about Sunday’s hive inspection, but I was out in the garden tonight and it was so beautiful that I took dozens of photos. 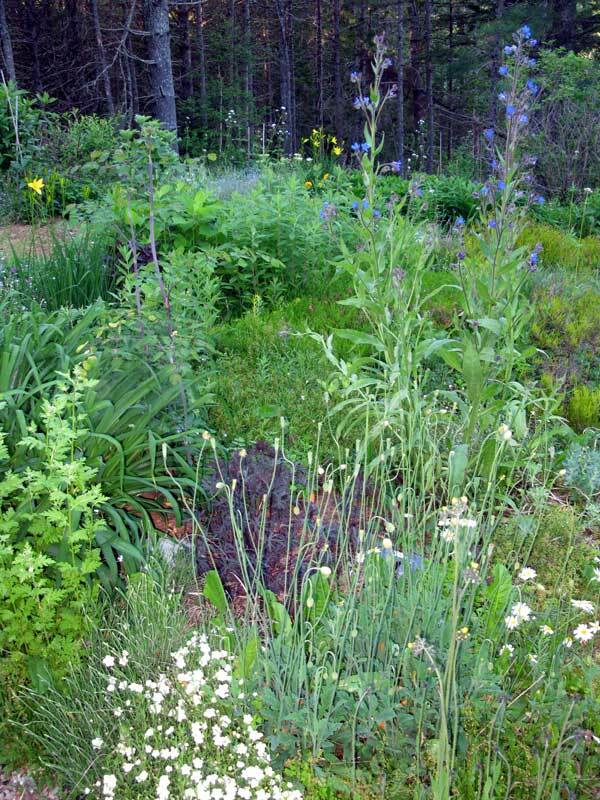 The combination of a wet spring (groundwater tables are finally above drought levels) and my 2012 resolution not to mow or weed-whack where it wasn’t absolutely necessary has produced a really lush environment, especially for Maine. 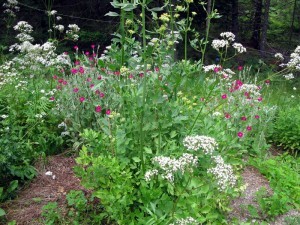 The valerian jungle hasn’t quite spread to the entire yard, but it’s a near thing. 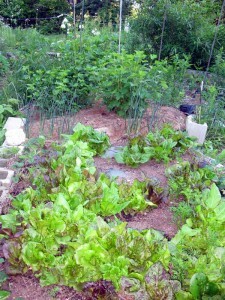 This is a very photogenic patch of Fedco’s “Freedom” lettuce mix. 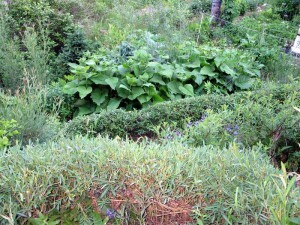 The view down the south hill, with newly clipped withy and a row of elecampne in front of the bog garden. 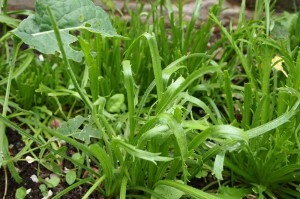 Red oakleaf lettuce growing through garlic and chives. 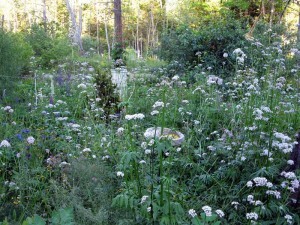 The view out back, into the alpine garden. 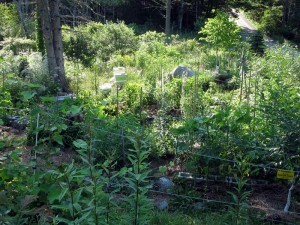 This entry was posted in gardening, horticulture, permaculture, perrenial, the backyard, vegetable garden and tagged Bar Harbor, garden, perrenial, spring, weather on June 14, 2012 by APo. This summer I’m trying out new techniques and a change of vision, inspired by looking at the Masters up close and personal in Paris a few months back. There are matters of scale and structure that never translated very well for me from textbooks. 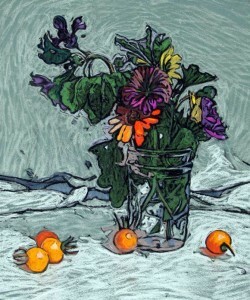 Now I have a laundry list of issues and a garden full of still life material and just need a few more hours in the day. 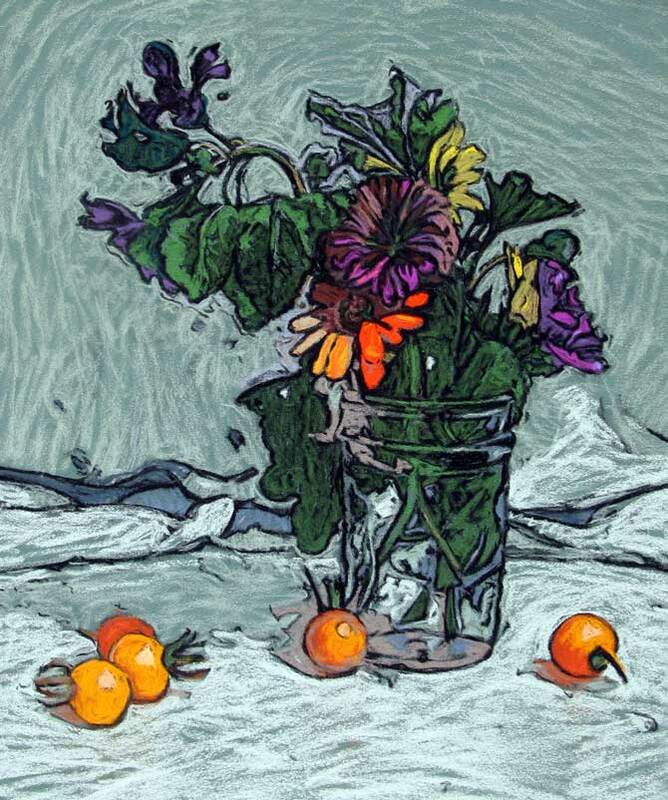 This entry was posted in art, horticulture, still life, studies, vegetable garden and tagged drawing, pastel, summer on June 10, 2012 by APo. 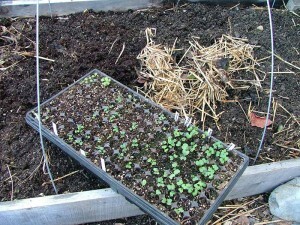 Started in raised beds outside: Oregon Giant snow peas, winter spinach, kale, chard, winter lettuce. 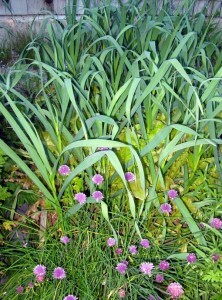 The fall-planted garlic is almost 3″ tall in the same beds. Those are regular, if eco-friendly, shop lights. I get the brand with the safest disposal protocols, but grow lights are only useful if you like to show off your African violet collection to its best advantage. 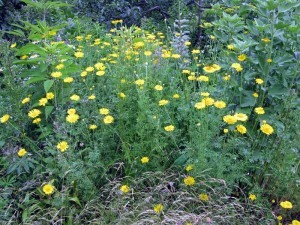 I use a peat-based growing medium that I recycle year to year with very little loss. 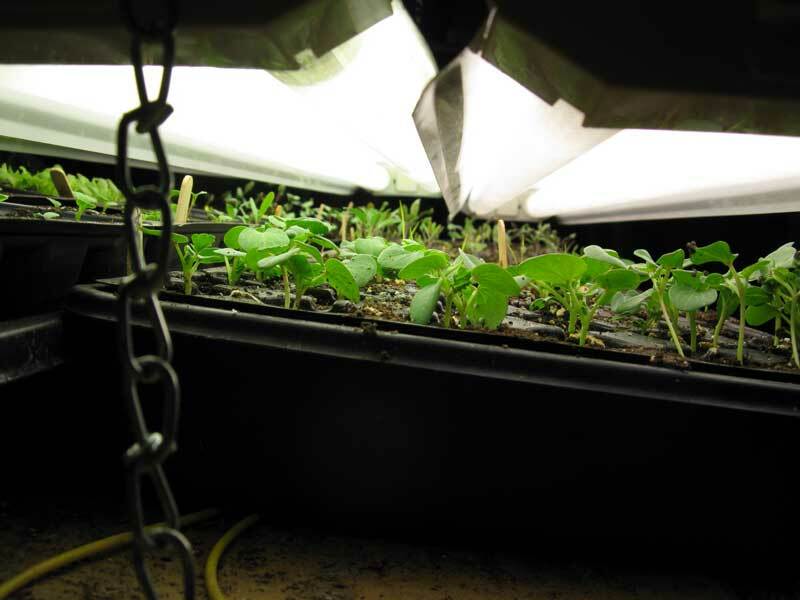 I allow the used cells to weather the Maine winter in the hoop house and so far haven’t had any disease or pest transmission. For those in milder climes I’d suggest baking or freezing the loose soil to specs that you can find at your Co-op Ext office. The average temperature in my unheated 20′ x 30′ cellar during Feb/March is 44 degrees F. It’s probably a tiny bit warmer directly under the lights – I should probably check that some day. The tomato and pepper seedlings take a while to get started, but the cooler temperature keeps the moisture levels constant and discourages rot. Tonight the temperature down there is closer to 39 because I didn’t notice that the north casement window had fallen open. I’ve closed it up and should be able to tell by tomorrow if anything was badly afflicted by the drop. The most important thing I’ve learned about starting seeds is to limit how many I plant (with a few exceptions). I’m terrible at editing healthy little green sprouts and that means I have too many to plant in the space available – maybe even too many to care for properly. 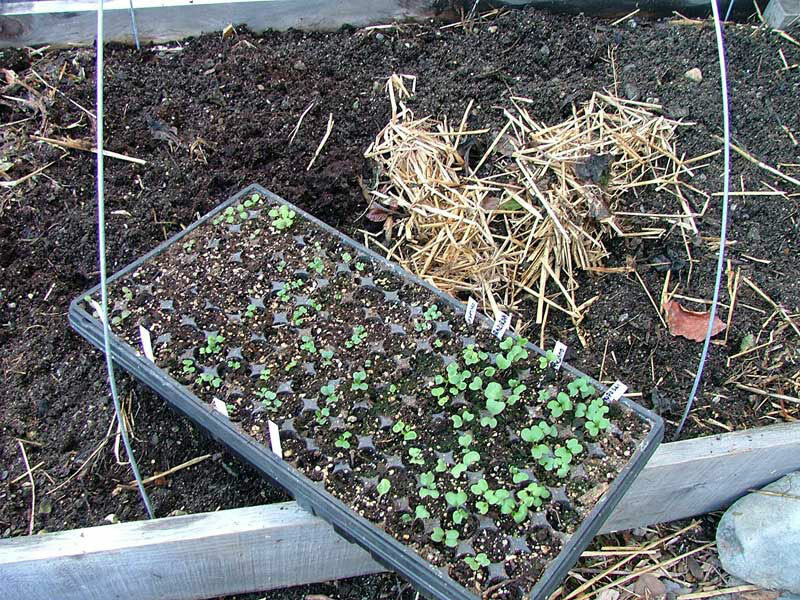 It’s much easier to plant fewer seeds at the start. The exception would be a crop that needs the whole season to grow (cannot be planted in succession) and should be harvested all at the same time, such as rice. This entry was posted in gardening, horticulture, Maine, the backyard, vegetable garden and tagged garden, seeds, spring on March 28, 2012 by APo.